An abridged, student-oriented edition of Hillel's earlier published Environmental Soil Physics, Introduction to Environmental Soil Physics is a more succinct elucidation of the physical principles and processes governing the behavior of soil and the vital role it plays in both natural and managed ecosystems. The textbook is self-contained and self-explanatory, with numerous illustrations and sample problems. Based on sound fundamental theory, the textbook leads to a practical consideration of soil as a living system in nature and illustrates the influences of human activity upon soil structure and function. Students, as well as other readers, will better understand the importance of soils and the pivotal possition they occupy with respect to careful and knowledgeable conservation. Students in soil chemistry and physics, as well as other environmental disciplines. 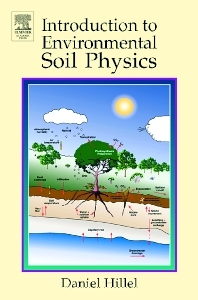 "...an excellent introductory text for an undergraduate course in soil physics. The book is well written and nicely presents the major topics of soil physics through the use of sidebars, boxes, worked example problems, color graphics, and informative figures and tables...the book provides a comprehensive list of recent and classic references for the reader to obtain more detailed information on the major topics covered...As a soil physics text, I've always appreciated that the author includes a treatment of water table fluctuation dynamics and an introduction to groundwater flow in confined and unconfined aquifers." --Nels Ruud, Furgo West Inc., Oakland, California, U.S.A.
"...recommended it to be used both by the students of environmental, agricultural and engineering, and also by specialists of this field. We are convinced that this study will open a new scientific research horizon in the field of soil physics." --Professor Corneliu Cismaru, Ph.D.